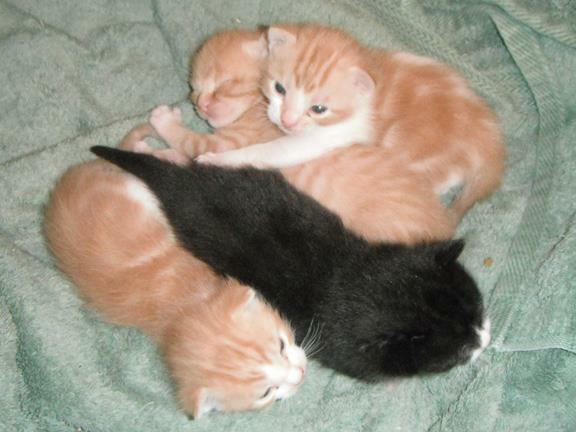 We’re contacted regularly by people who have found a kitten or a litter of kittens and want us to take them. While it’s a little less challenging to find placements for kittens who are 4 weeks and older, trying to find a foster parent who can care for kittens 0 to 4 weeks old is a challenge. Foster parents who bottle feed are in short supply and can often only take on one litter at a time – because for such little beings, caring for underage kittens is a lot of work and not much different than caring for a newborn human. 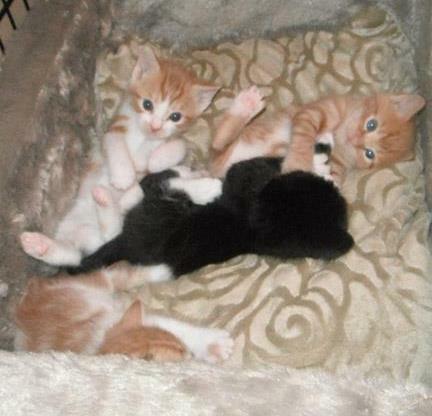 Most foster parents have full time jobs and are unable to take maternity leave to care for a litter of kittens. The only thing we can do is try to network the kittens in the hope that we can find someone who has the experience and time to take on bottle babies. Sometimes well-meaning people unknowingly separate kittens from their mother. Ultimately, the goal is to keep baby kittens with their mother for as long as possible for the best chance of survival. The mortality rate for kittens separated from their mothers is much higher than if they had been kept together. So, before you nab those kittens, wait and watch to see if momma returns. 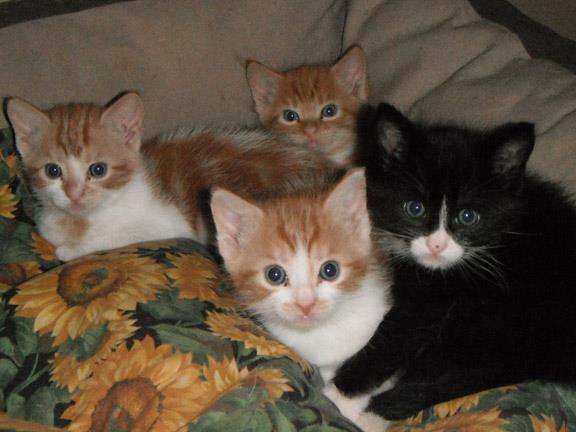 Often, unattended kittens haven’t been abandoned. Their mother has simply left them in what she thought was a safe location in order to find food to replenish herself so she can continue to feed her babies. Imagine her distress when she returns and finds her babies gone! If the kittens are safe but mom is nowhere in sight, you should quietly observe from a distance so as not to scare away a shy or feral mother. Momma cat will usually stay with her babies for one to two days after giving birth. After that, she may leave for short periods to hunt for food or to look for a safer location for her litter. Mother cats will instinctively start moving their young one-by-one to a new location to ensure the safety of the litter. 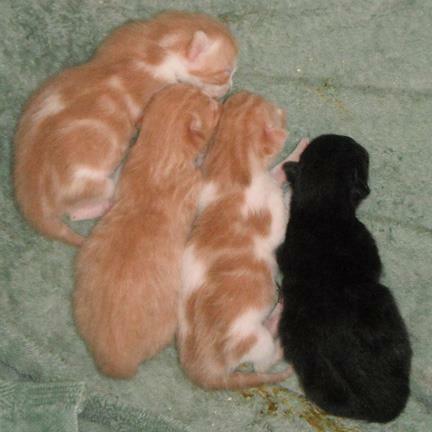 When kittens are newborns to about 4 weeks old, they need to be fed every 2 to 3 hours. Momma cats know this and will never be gone longer than this when foraging for food. If, however, after 2 to 3 hours, momma doesn’t return, chances are she may not because something happened to her. Only then should you consider collecting the kittens and taking them into your care. If the kittens are clean, plump and sleeping quietly, chances are mom isn’t far away and you are better off leaving them alone. On the other hand, if the kittens are dirty, in a soiled area or crying because they are hungry, it could mean they have been abandoned. If you have waited to see if momma has returned and she has, it’s always best to leave the kittens with their mother – especially if they are under 4 weeks of age as kittens are not able to eat solid food or urinate and defecate on their own until this age. They still need mom for nourishment and to stimulate their bottoms to prompt elimination. There is nothing better for their overall health than mom’s milk and her ability to care for them. 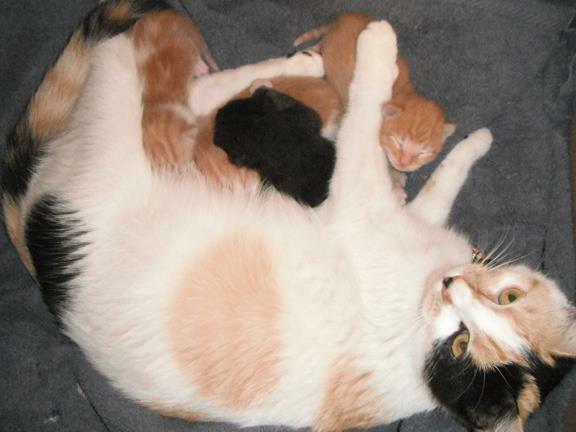 Yes, we understand it’s probably not ideal that you have a mom with kittens in your vicinity. Most who contact us are quick to tell us it’s not. Or, you may be fearful or concerned about their well-being. If you can give them some kind of food and shelter, either in your home, your garage or even a large dog crate, you can keep the entire family safe until the kittens are old enough to be separated from their mom (ideally 8 weeks old but, if necessary, 6 weeks is okay). If you have waited and determined momma probably won’t be returning, it’s safe to take the kittens into your care. Keep them warm and, if you are inclined, watch a video on YouTube about feeding bottle babies, go out and buy bottles and KMR formula and see if you can raise the babies on your own. Remember, babies under 4 weeks old cannot eat solid food yet and do need to be bottle fed every 2 to 3 hours, round the clock, every day until they reach the age when they’re ready to try solid food. They also need their bottoms stimulated with a warm cloth right after eating to prompt urination and defecation. They can’t do it on their own yet. Please DO NOT feed kittens cow’s milk! Kittens are lactose intolerant to cow’s milk and ingestion will inevitably cause stomach upset and cramping, bloating, gas and diarrhea. If you are unable to care for the kittens, please do not contact your local city shelter. Kittens and puppies under the age of 8 weeks old without their mothers are often euthanized as soon as they are surrendered. Shelter staff does not have the resources or manpower to care for underagers. The only option left is to contact a rescue group like ours. However, again, please keep in mind that you are just one of many people who has contacted us this week about a similar situation. Unfortunately, we only have so many foster homes and most of the time, they’re full. Even fewer are foster parents who have the experience and time available to bottle feed. As much as we’d love to help out in all situations, the reality is we are limited in resources, space, funding and people willing to open their hearts and homes to kitties in need. 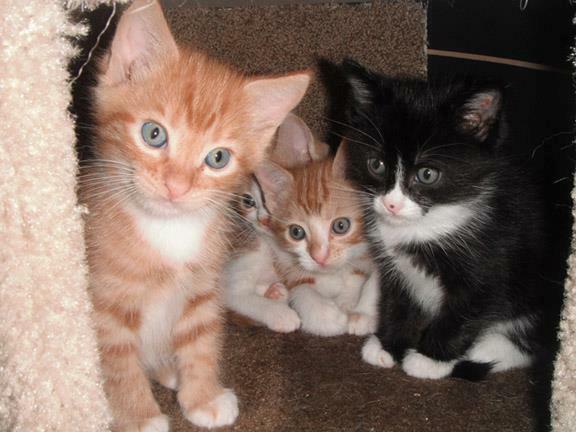 We are only able to consider kittens who are within Devore Shelter’s jurisdiction. We can’t guarantee we can secure a placement. All we can do is try. So, when you contact us, please give us as much information about the kittens as you can. How old are they (review the photos in this article to get a sense of age)? What color are they? Are their eyes open or sealed shut? Are they clean or dirty? Are they skinny or plump? Have you waited for mom and determined she won’t return? Chances are, we will probably direct you to our Surrender Form. And, you will need photos. It is virtually impossible for us to network to try to find a bottle feeder for young kittens without photos.